I have always love baking with different types of fruits and one of my favourite has got to be bananas! The sweetness of this fruit is good for cake, muffins, bread and it even goes well with peanut butter in a sandwich. 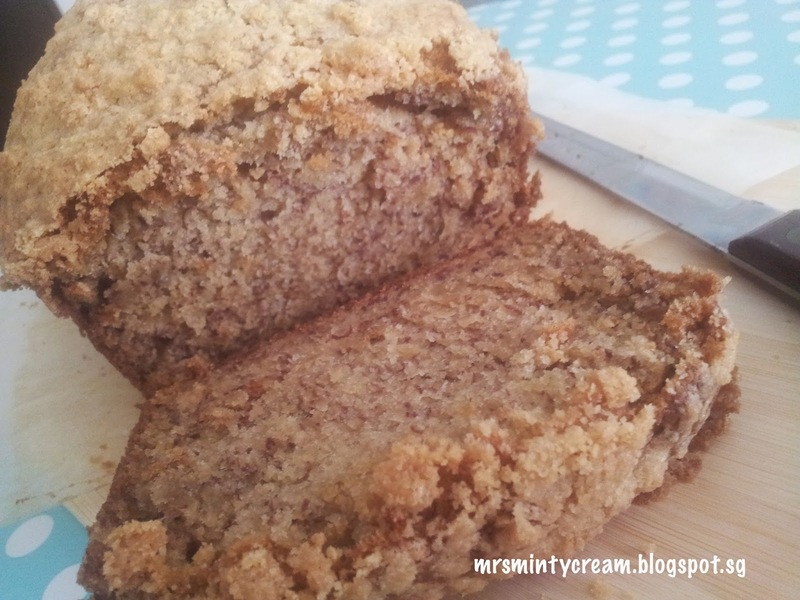 My mum has always been a great lover of banana bread and since young, I have kind of pick up on this love of hers and there is no way I can resist a soft and fragrant piece of banana cake/bread. In my kitchen, I always seems to have a couple of overripe bananas on the counter top every now and then and it's strange how excited I get when I see them turning dark and black. And why is that so, you asked? 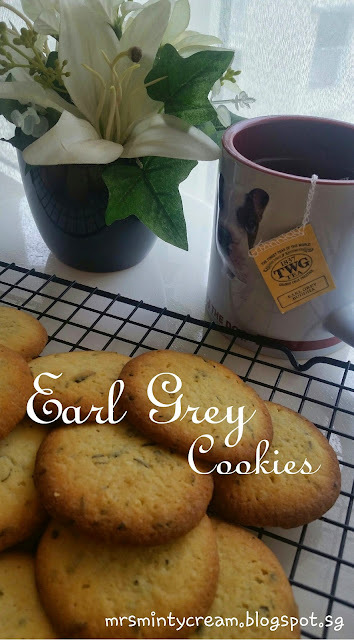 Simply because the darker they get, the sweeter they are and that make them so PERFECT for baking! 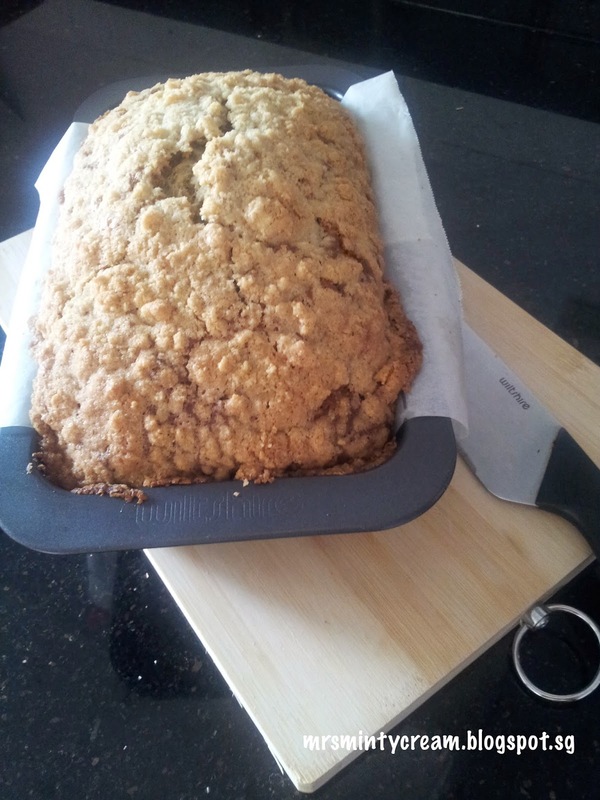 For this particular recipe of Banana Loaf with Streusel Topping I am sharing, you got to love the topping as well! Trust me on that. 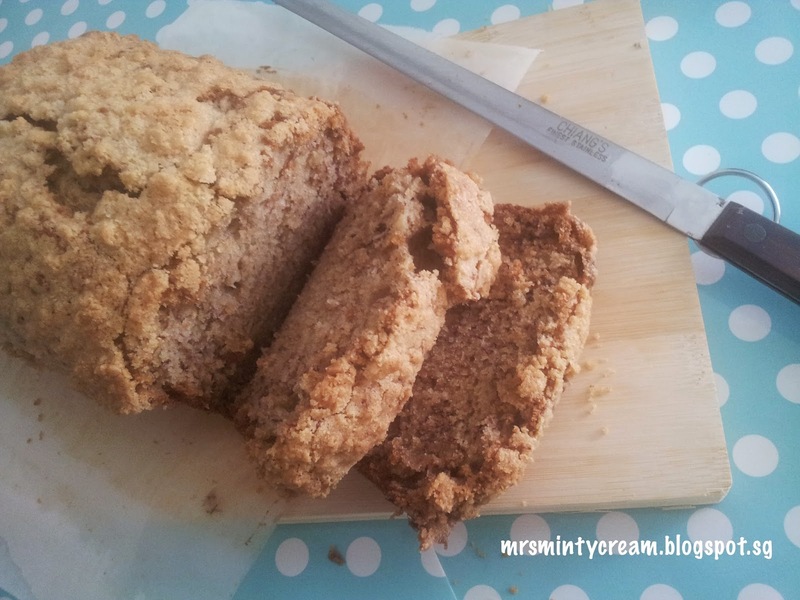 The topping is crumbly and sweet and it goes perfectly well with the soft banana bread. Not to mention, I simply adore the combination of brown sugar with butter! On the other hand, if you are not such a huge fan of Streusel Topping, you may replace it with a cream cheese frosting and it will taste just as good! 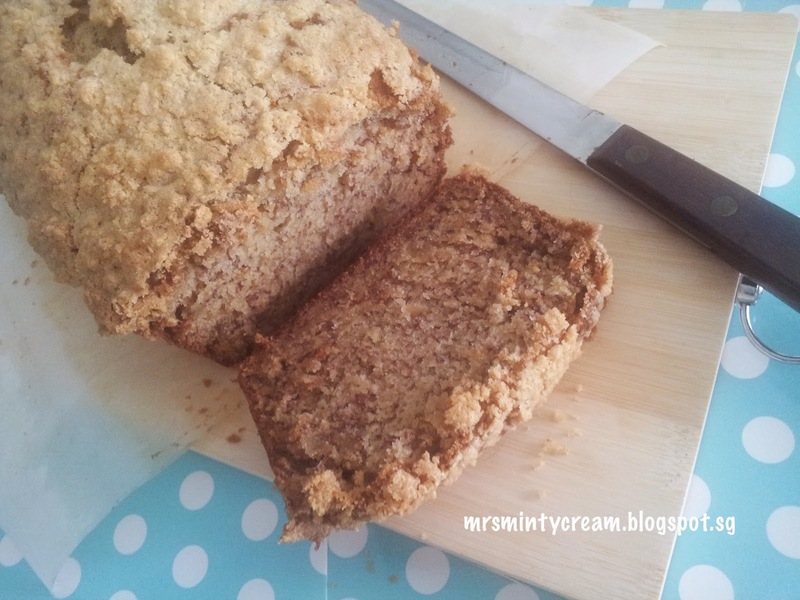 The loaf itself is loaded with banana and that definitely helps to ensure that the loaf remains moist and rich! I just love it when my kitchen is filled with the smell of freshly baked Banana Bread. Don't you? 1. Preheat oven to 180C. 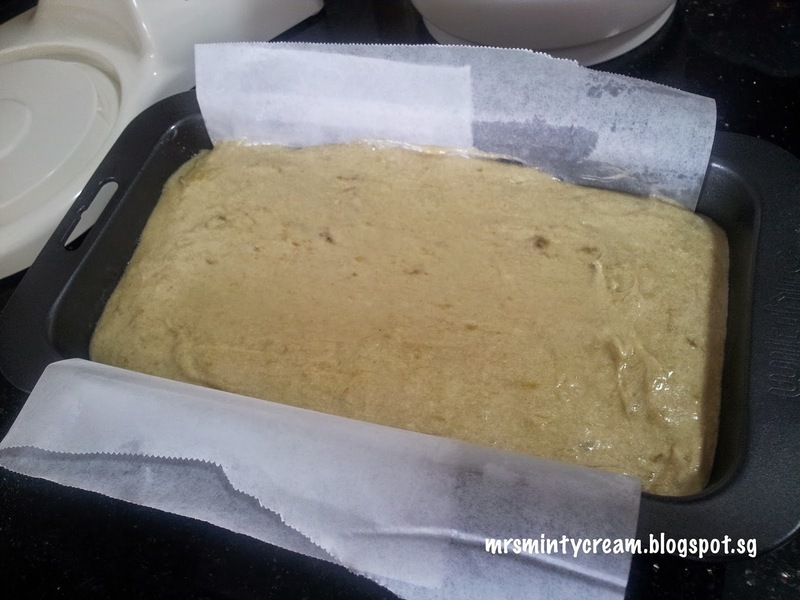 Grease and line loaf pan with non-stick cooking spray and baking paper. Set aside for later use. 2. To prepare the streusel topping, combine the brown sugar and flour in a small bowl. Using a pastry blender or a fork, cut in the cold butter until coarse crumbs are obtained. 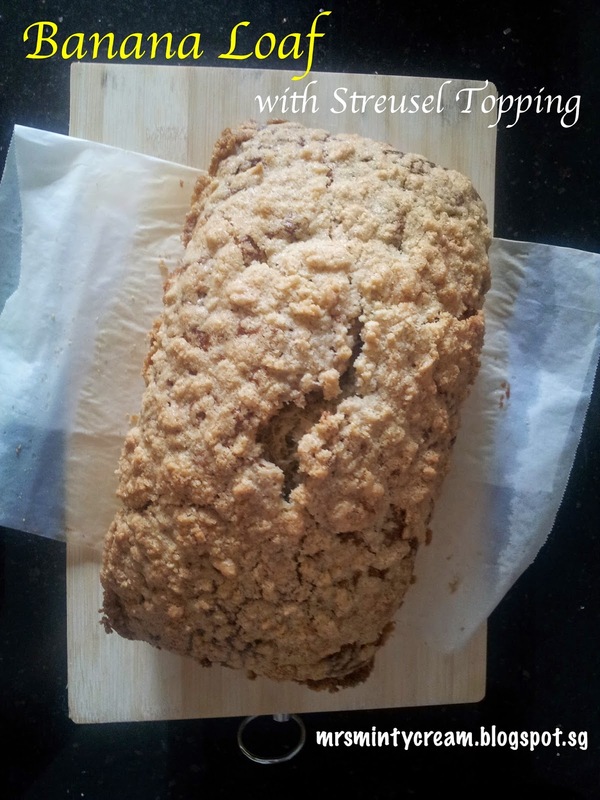 Refrigerate the streusel topping until it is ready to use. 3. Sieve the dry ingredients (flour, baking powder, baking soda, salt and cinnamon) together and set aside. 4. 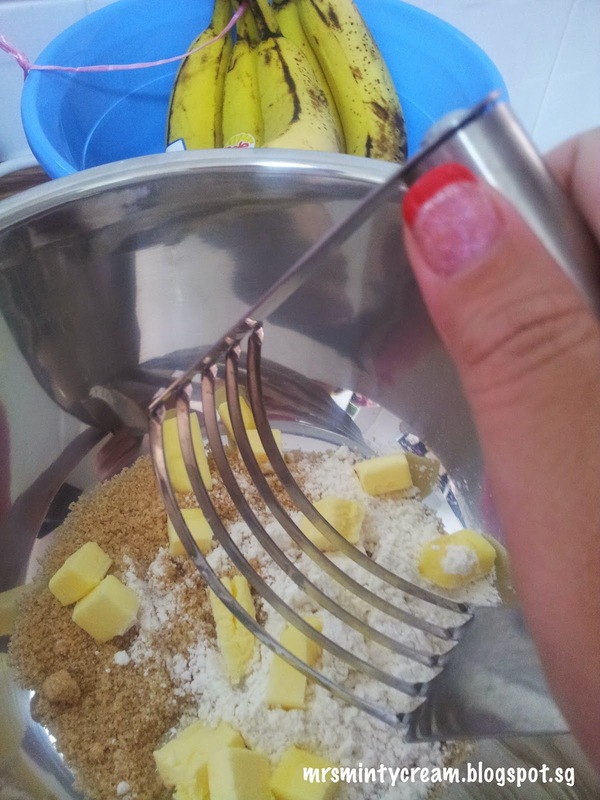 In a mixing bowl, mashed the bananas using a fork until you get a thick mash of banana. 5. To the mashed banana, add in the eggs, sugar, butter and vanilla extract. Whisk these ingredients together using a whisk until they are well combined and a thick mixture is obtained. 6. 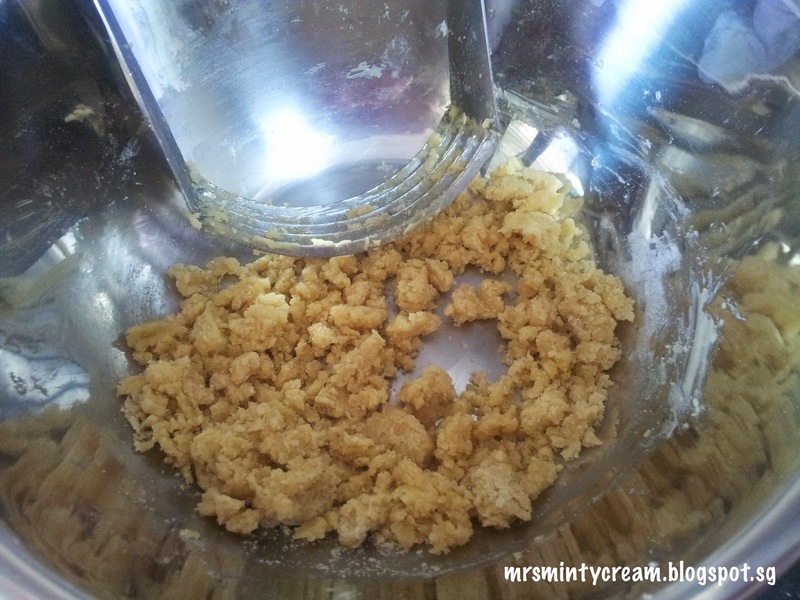 Make a well in the middle of the dry ingredients in Step (2) and add in the wet ingredient in Step (4). Mix well using a whisk / spatula. 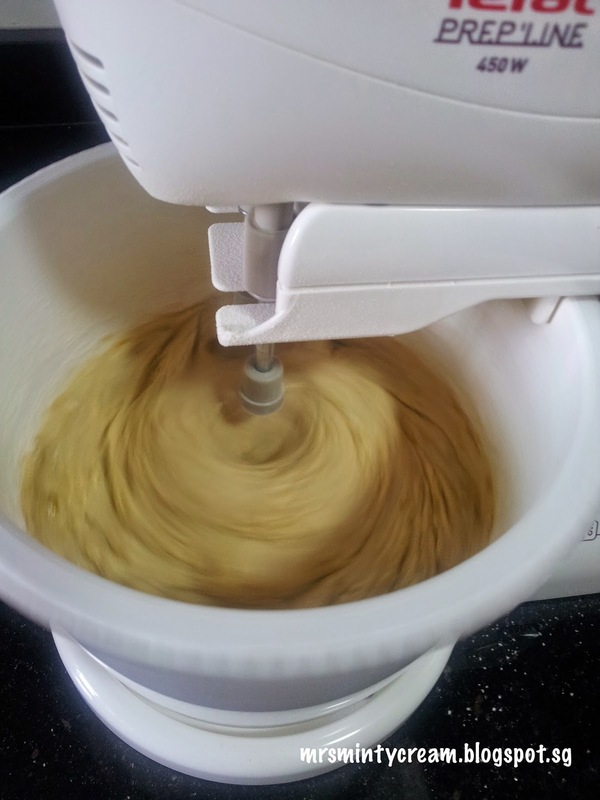 Make sure that the combined mixture is well-mixed, with no trace of flour. 7. 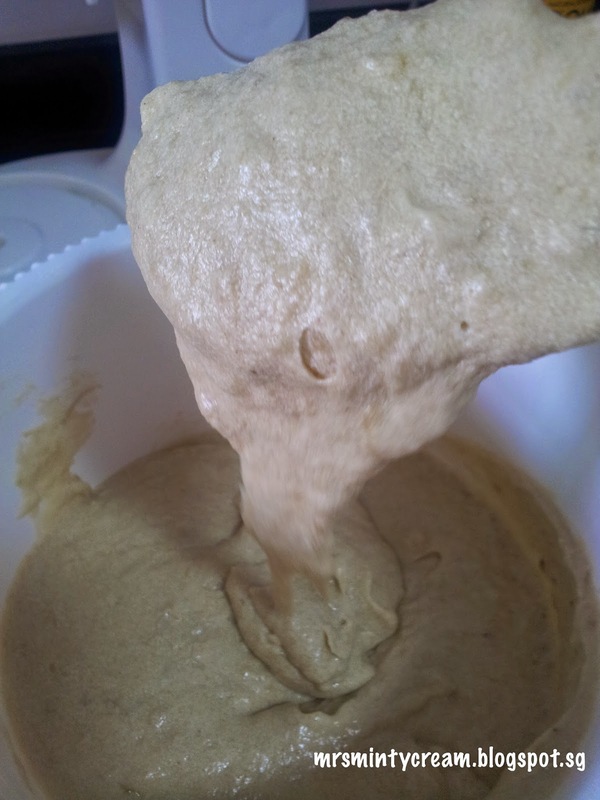 Pour the creamy batter into the loaf pan. Using a butter knife, run the knife through the batter a few times so as to remove any air bubbles. 8. 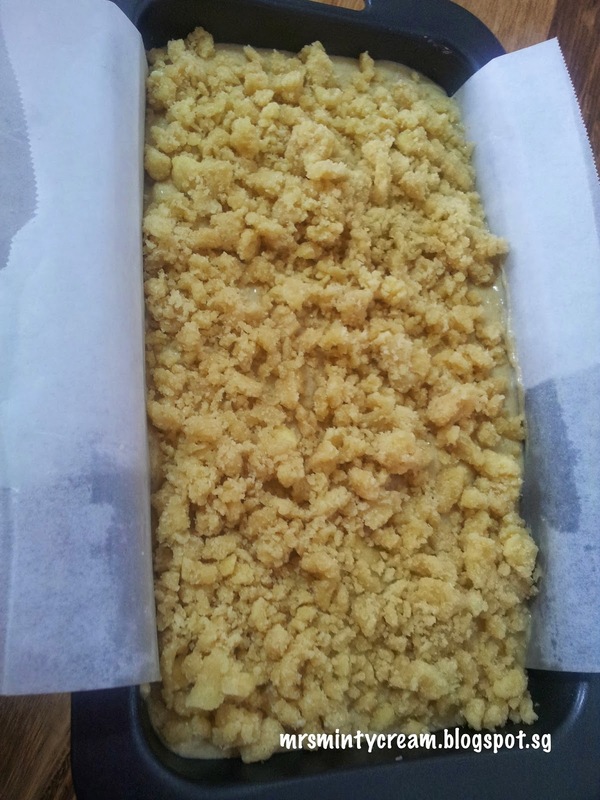 Remove streusel topping from refrigerator and sprinkle them on the top of the batter evenly. 9. Bake for 45 to 55 minutes, or until toothpick when inserted comes out clean.